If our blog post about the launch of Beatrice Colin’s latest book, “To Capture What You Cannot Keep”, has whetted your appetite, then come along to join us for a drink and hear more about it at Waterstones Ayr on the 2 March at 7pm. Beatrice will be there to discuss and read excerpts from her novel, and if the Glasgow launch is anything to go by, it will be a very enjoyable evening. Afterwards Beatrice will be happy to sign copies of her book. The novel is beautifully written and and builds a very evocative atmosphere of Paris in the late 1880s. It is based around the construction of the Eiffel Tower, and as it grows, so does the romance between Caitriona Wallace and Emile Nougier. Cait and the Arrol niece and nephew are fictional creations, but many of the characters are based on historical figures and have been well researched, including William Arrol. Although he isn’t one of the central characters, he has a strong presence throughout the novel and has been sympathetically portrayed. In the story, during an encounter with William Arrol, a reference is made to the house he was building in Ayr “with a vast conservatory and a view of the Firth of Clyde”, what was to become Seafield House. Friends of Seafield House (FoSH) have organised the evening in association with Waterstones Ayr who are putting on the event to celebrate World Book Day and the launch of the novel, with its Ayr connections. Drinks will be served in store from 6.30pm and members of the FoSH committee will be there to answer any questions about Seafield House and Sir William Arrol. Tickets are free and available now from Waterstones in Ayr or by phoning 01292 262600. Further details are on the Waterstones Ayr website and Facebook page. On hearing the news that Seafield House was saved, last week Chic Brodie MSP lodged a motion in the Scottish Parliament to congratulate Friends of Seafield House. The motion was published today in the Motions and Amendments on The Scottish Parliament website. *S4M-11191 Chic Brodie: Seafield House in Ayr—That the Parliament congratulates the Friends of Seafield House in Ayr on what it understands has been their long battle to save Seafield House, which once owned by Sir William Arrol, considered one of Scotland’s greatest design and civil engineers, and believes that securing the future of the house, which it sees as an outstanding architectural and historical development, is a tribute to all of those involved in this hard fought campaign to save it for Ayr and Scotland. Our thanks go to Chic Brodie for this acknowledgement on the success of the campaign. Friends of Seafield House (FoSH) are returning to Rozelle House, Ayr, for National Science and Engineering Week 2014. The theme of this year’s event is Steps to Discovery 2014: Bicycles, Bridges and Beyond and you can read details of the programme of events on the South Ayrshire Council website. On the weekend of the 15/16 March the event programme will focus on Bicycles and on 22/23 March on Bridges. Viewing of the film “The River is Spanned“, a reconstruction of the building of the Forth Rail Bridge using original photographs. Made in 1950 this film is shown by courtesy of the filmmaker Harry Birrell and Scottish Screen Archive. A chance to view stereoscopic photographs of some Arrol bridges – the 3D TV of Sir William Arrol’s time! Bridge building activities in partnership with the Meccano Society of Scotland with meccano models of Arrol’s Tower Bridge and Middlesborough Transporter Bridge. Plus the opportunity to try your hand at building your own meccano bridges. If you are unable to join us at the weekend you can still see the accompanying exhibition focusing on Sir William Arrol and his bridge building, which has already opened at Rozelle House. 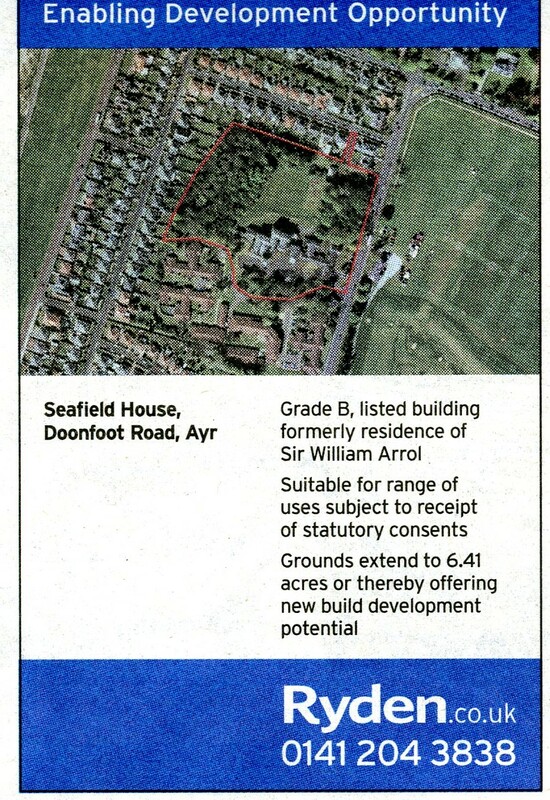 Information will also available on FoSH and their campaign to save Seafield House in Ayr, which was Sir William Arrol’s home for many years. 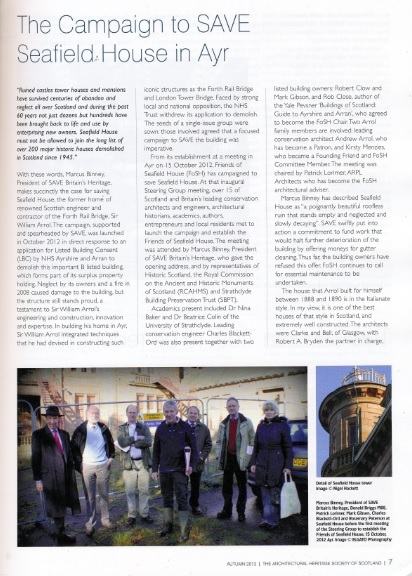 The Autumn 2013 issue of the Architectural Heritage Society of Scotland (AHSS) magazine featured an article on the Seafield House campaign. The article was written by our own Rob Close, Chair of the Friends of Seafield House (FoSH), and outlines the importance of Seafield House and the history of the campaign to save it. The Architectural Heritage Society of Scotland is concerned with the protection, preservation, study and appreciation of Scotland’s buildings and has about 1000 members throughout Scotland and beyond. Our thanks go to AHSS for publishing the article and the tremendous boost it will give to awareness of our campaign. 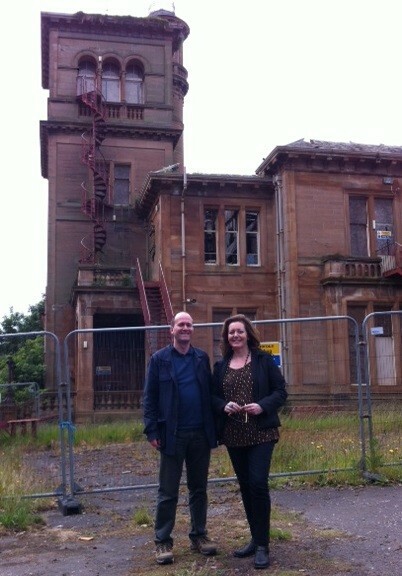 Read the AHSS magazine article – The Campaign to SAVE Seafield House in Ayr. Friends of Seafield House (FoSH) is marking the approach to the first year of campaigning, together with SAVE Britain’s Heritage, to save Seafield House with a Public Meeting in Ayr on Friday 11 October. The focus of activity over the past months has been the NHS Trust’s new marketing campaign to sell Seafield House. 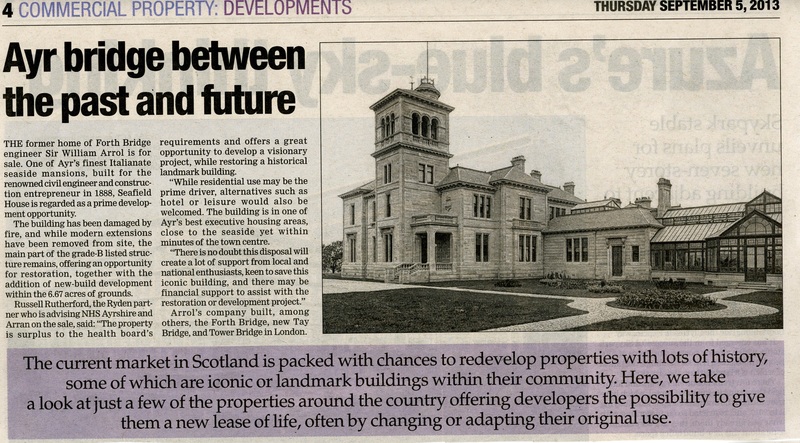 This new approach could see restoration of Seafield House by way of enabling development. FoSH & SAVE were present at the Developers Open Day last month that formed part of the launch of this new marketing campaign. Members of the public are invited the meeting where FoSH Chair, Rob Close, and architectural adviser, Patrick Lorimer, will give an illustrated presentation & campaign update followed by an open discussion. We look forward to seeing all those who can attend the meeting in Ayr and hearing your ideas and suggestions for the campaign and/or would like to renew membership or take out membership of FoSH. Download the flier with details of the meeting. Tea and Coffee will be served at the meeting. For those who are unable to attend we would still love to hear from you with your ideas via the website Contact page. Ryden has recently launched a new marketing campaign for Seafield House that stresses the enabling development opportunities that the 6.67 acres of grounds offer to those who take on the restoration of the B-Listed Seafield House. In the campaign, Ryden highlights the importance of Seafield House as the former residence of Sir William Arrol [1839-1913], whose company constructed iconic engineering landmarks including the Forth Rail Bridge & London Tower Bridge. 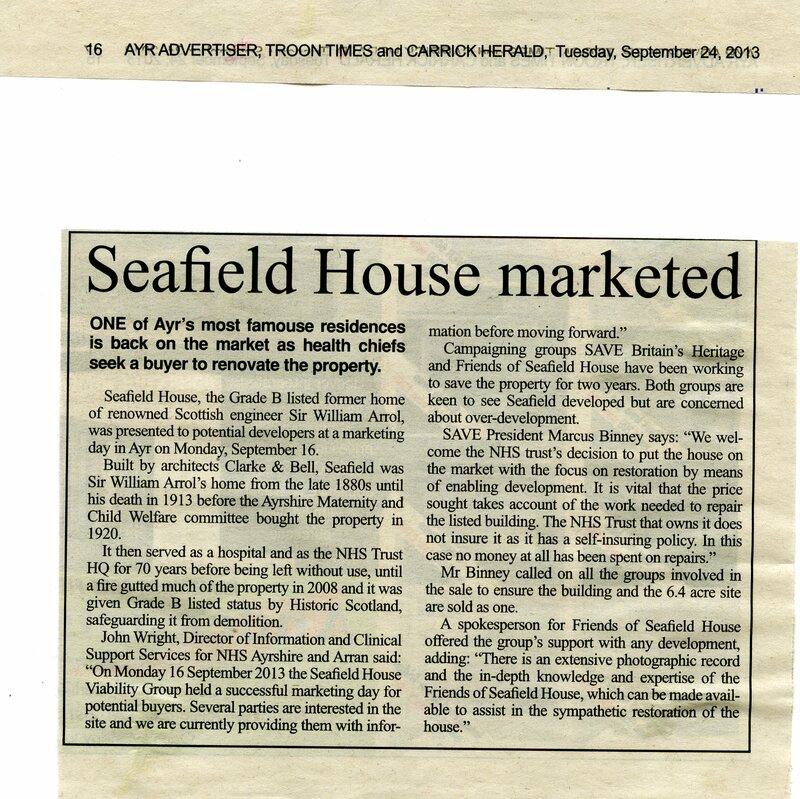 See the Ryden website for details of the sale of Seafield House. The campaign includes an Open Day for developers and other interested parties on Monday 16 September from 1.30pm-5.00pm at the Savoy Park Hotel, 16 Racecourse Road, Ayr, South Ayrshire, KA7 2UT. Savoy Park Hotel is located a short drive from Seafield House. Site visits will be arranged throughout the afternoon. Developers & interested parties should contact Russell Rutherford at Ryden by email russell.rutherford@ryden.co.uk or on 0141 204 3838. Representatives from Friends of Seafield House and SAVE Britain’s Heritage will be attending the Open Day. 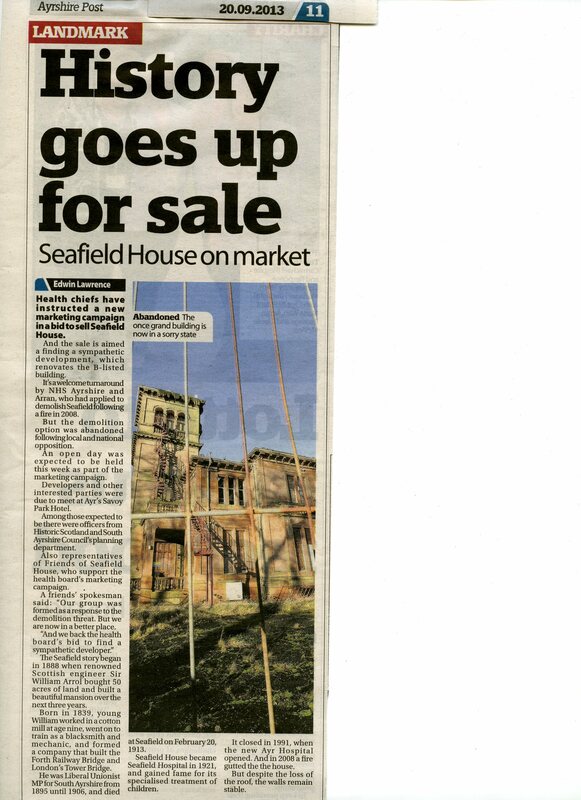 SAVE have made Seafield House their Building of the Month on the back of the current marketing drive. 27 Sep 2013, Ayrshire Post: Bob Shields Comments…..Bob Shields suggests that we may see nothing happen till 2088; FoSH believe that the day will come much sooner! Seafield House was visited last week by two renowned academics who are experts in architectural conservation, both of whom are interested in getting involved with the project to save Seafield House. Cristina Gonzalez-Longo is a lecturer in Architectural Heritage Conservation and Community Identity at the University of Strathclyde and Dimitris Theodossopoulos is an expert in the structural aspects of historic architecture and a lecturer in architectural structures and conservation technology at the University of Edinburgh. Cristina starts a new masters course in conservation at the University of Strathclyde in autumn 2014. She has been a project and resident architect in high-profile design and conservation projects, such as the Grade A Listed Queensberry House, which is part of the new Scottish Parliament building. Cristina approached FoSH with the proposal of a PhD studentship or knowledge exchange project and we welcome her input and expertise.